This was another race I entered long before I broke myself in Hawaii. I was going to be down in Wanaka to watch my friend Nicky do the Challenge race anyway and then the Half was announced so thought I may as well do it. Wasn't quite sure how I would back up from Tauranga the week before but thought I would give it a go. The couple of days before the race hadn't been all that warm and the lake was freezing so I was quite worried about not warming up on the bike but race day dawned with a clear, cloudless sky so not warming up didn't seem like it would be too much of a problem anymore. I didn't want to get in the water too soon before the start and then get cold so did about a 5min warm up and then only had a couple of minutes before the gun went so think I timed it well. The swim was sooooo much better than Tauranga the week before, just like swimming in pool with no nasty currents. Was in a group for about 2/3 of the way and then dropped off a bit towards the end. I had my own personal kayaker for about 500m which was weird, I started to think I was the tail-end charlie or maybe I looked like a weakling that could drown at any minute. But I certainly wasn't last so that was good to know. Swim time was 31.38 which is pretty standard for me, and I was 12th girl out. There was a very long run up to transition and as I was running I couldn't undo my wetsuit which was a bit of a problem. Lucky there was a change tent with some helpful volunteers who eventually got it undone, it had split open in the middle so there was no way I could undo it myself. So after a ridiculously long transition I jumped on my bike ready to tackle the hills. I had hoped to ride well on this course since I am better on the hills than the flat so started out nice and strong. Hands and feet were a bit cold but not too bad, it took about 90mins for my feet to feel completely thawed but hands came around after about 20mins or so. Taptap was with me which was nice but I was mainly just riding to how I felt anyway but ended up with the power I expected to do. Passed a few people in the first section and saw a few girls ahead of me at the turnaround. Elina Ussher was riding for a team (they started 5mins behind us) and she passed me after about 18km so we rode together for the next 35km or so, we were quite well matched for pace so took it in turns riding at the front which seemed to work until she dropped me on a flat section a bit before Hawea. 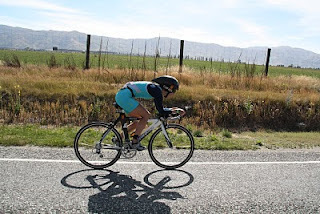 I had passed quite a few girls and a marshal at Hawea said I was 2nd woman which was a nice surprise. There were a few tough hills out of Hawea but the rest wasn't too bad. Had a bit of company for the last 10km but a few stretches by myself and came into transition as the 2nd individual woman. Ride time was 2hr48 which was the fastest bike split for the women which was a bit of an achievement. The fastest male bike was only 2hr27 so its not exactly a fast bike course. The rest of the day was spent watching the Challenge athletes, in particular Nicky, Nick, Jess, Celiacsky, Amanda, Stu and LTH. Credit must go to Nicky for completing her first Iron-distance race, to Jess for coming 6th woman, to Nick for beating Jess and smashing it on the bike, and to Amanda for being the first age-grouper. Good work team. And congratulations to Richard Ussher for breaking the course record and to Gina for winning for the 3rd year straight. Guess the preferred wetsuit brand in the house?! Go Jess, she was telling us at this point that she never wants to do an Ironman again, HA!